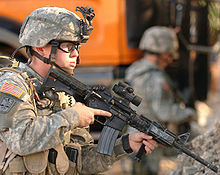 ↑ "M4 Carbine". Asia Pacific Defence Solutions Group. สืบค้นเมื่อ 2009-01-20. ↑ 3.0 3.1 3.2 "The 5.56 X 45mm: 2008". The Gun Zone. สืบค้นเมื่อ 2009-01-27. 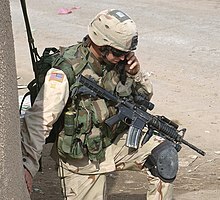 ↑ "Georgian army replaces Kalashnikov with U.S. rifle". Reuters. 2008-01-18. สืบค้นเมื่อ 2009-01-19. ↑ Christopher J. Castelli (September 2008). "Department of Defense to equip Lebanon's Special Forces with Small Arms, Vehicles" (PDF). DISAM Journal. สืบค้นเมื่อ 2009-02-08. หน้านี้แก้ไขล่าสุดเมื่อวันที่ 16 เมษายน 2562 เวลา 14:45 น.